University of Michigan Press, 9780472118908, 760pp. After his mysterious death, Dag Hammarskjold was described by John F. Kennedy as the "greatest statesman of our century." Second secretary-general of the United Nations (1953 - 61), he is the only person to have been awarded the Nobel Peace Prize posthumously. Through extensive research in little explored archives and personal correspondence, Roger Lipsey has produced the definitive biography of Dag Hammarskjold. 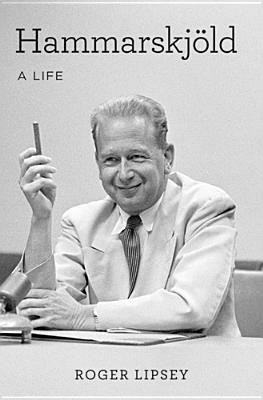 Hammarskjold: A Life provides vivid new insights into the life and mind of a truly great individual. Hammarskjold the statesman and Hammarskjold the author of the classic spiritual journal Markings meet in this new biography - and the reader will meet them both in these pages. A towering mid-twentieth-century figure, Hammarskjold speaks directly to our time. Roger Lipsey, author, art historian, editor, and translator, has written on a wide range of topics and intellectual figures. He was the general editor of the three-volume edited works of Ananda K. Coomaraswamy. Other works include An Art of Our Own: The Spiritual in Twentieth-Century Art and the prizewinning Angelic Mistakes: The Art of Thomas Merton. He is director of the parent company that publishes Parabola magazine.